U.S. smartphone buyers are getting another Windows 10 Mobile phone to chose from, one that’s much cheaper than Microsoft’s high-end Lumia handsets. 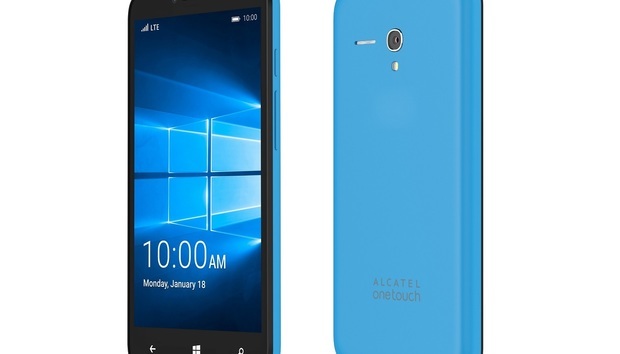 The Alcatel OneTouch Fierce XL with Windows 10 is now available through T-Mobile for $140 without a contract. Buyers can also get the phone for no money down and $5.84 per month. For that price, you get a 5.5-inch 720p display, 1.1GHz quad-core processor, 8MP rear camera, 2MP front camera, 2GB of RAM, 16GB of storage, and a microSD card slot. In terms of price and performance, Alcatel has managed to outdo Microsoft’s own low-end Lumia 550, which launched late last year. The Lumia 550 also costs $140 and has a 1.1GHz quad-core chip, but only includes a 5MP rear camera, 1GB of RAM, and 8GB of storage. Beyond those two handsets and Microsoft’s flagship Lumia 950 and 950XL, U.S. shoppers don’t have any other options for Windows 10 Mobile. Last week, Vaio announced a business-centric Vaio Phone Biz for overseas markets, but the company recently said it has no plans to bring the phone stateside. Acer has also thrown some support behind Windows 10 Mobile with the Jade Primo, but hasn’t announced any U.S. launch plans. Why this matters: The future for Windows 10 Mobile is far from certain, with limited support from phone makers and dwindling sales for Microsoft’s own Lumia handsets. But if you’re curious to see the state of Microsoft’s mobile operating system, or just want a basic phone that integrates well with Microsoft services, Alcatel’s Fierce XL could be the best option that doesn’t cost a whole lot.